Have you ever wondered what goes on behind the scenes when installing an exhibition? I documented the installation process for Remembering the American Revolution 1776-1890, which opens today. Remembering the American Revolution is full of objects people saved to keep alive the memory of the fight for independence. To match the patriotic theme of the exhibit, we painted the walls of the Main Gallery blue, and object and label stands red. The early stages of exhibit building consist of a lot of painting, drilling, and measuring. 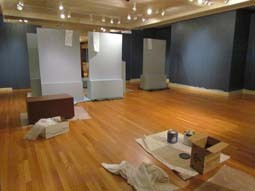 During this time, we also finished putting away our last exhibit. Eye on Elegance: Early Quilts of Maryland and Virginia had thirty-six quilts on display that all needed to return to storage. Before doing that, each quilt had to be cleaned to remove any dust or impurities. 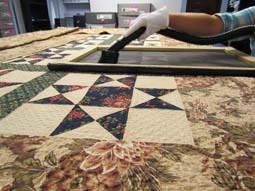 To accomplish this, registrars vacuumed the front and back of each quilt using a protective screen, which could take up to an hour per quilt, depending on its size. Once everything in the Main Gallery had been painted, it was time to start putting displays together so they were ready to house objects. Museum Attendant Maria Franco cleaned all of the cases so they were ready to receive objects. The DAR Museum collaborated with Pat Chester of Chester Design Associates, who designed the exhibit and made layouts detailing the overall exhibition, as well as each individual section, specifying where objects, stands, and labels should go. These layouts assist Museum Preparator Leo Sylvester in putting together the displays and creating object mounts. My personal favorite section in the exhibit is one where the Centennial celebration flag hangs. It was exciting to watch Collections Manager Anne Ruta, Associate Registrar/Assistant Curator Carrie Blough, and Leo take the flag out of its storage box, hang it, and get the lighting just right. 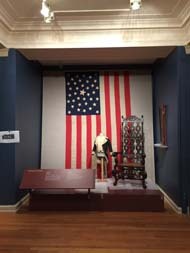 Among other objects in Remembering the American Revolution are the spinning wheel that was the model for the NSDAR insignia, the first speech by a first lady, a sofa owned by a signer of the Declaration of Independence, and a copy of the famous “Rising Sun” chair from Philadelphia’s Independence Hall. A main responsibility of the registrarial team is to ensure objects are displayed under proper conditions so they can continue to be enjoyed by future generations. 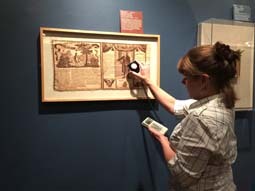 Here, Carrie tests the number of foot-candles on a handkerchief bearing the image of George Washington with a light meter. A foot candle is the light produced by one candle within one square foot of distance. Each object has a certain foot-candle limit, and if the number is too high, the light could damage the object. Follow DAR Museum on Facebook, Twitter, and Pinterest for more information about Remembering the American Revolution 1776-1890. #TBT 125 years ago, on April 19, 1894, the Sequoia Chapter in San Francisco, California, planted a �... 20 hours 13 min ago.